They are more than likely the first thing you touch when you rise and the last thing you touch before closing down the kitchen and brushing your teeth before bed. The hardware that you place on your kitchen cabinets and bathroom drawers can make a big difference to your decor. The wide range of finishes available for the faucet, door handles and drawer pulls can be dizzying. From brushed or polished nickel to shiny stainless steel, each finish will change the look of your space. A long-standing favorite is a bronze finish, which comes in a wide variety of shades and sheens. A bronze finish on faucets, locksets, kitchen drawers or office cabinets complements most existing finishes and colors in your kitchen, bathroom, office and bedroom. From a rich chocolate to a deep matte black with mossy green or gold edgings, a bronze finish adds warmth, texture and beauty to your living spaces. The right bronze patina adds a touch of personality to your fixtures and your cabinetry's hardware. Natural bronze color has a mix of copper and tin that gives it its tint. It has a natural blond, gold hue before it is aged into its distinct mottled brown patina. It is a durable and versatile material that provides heft in sink fixtures or a delicate touch to the knobs on your drawers and cabinets. Bronze will continue to age and look stylish for decades after installation. These two colors are the most popular of the bronze finishes. They are typically found on kitchen cabinet hardware. While they may look nearly identical, they have different maintenance needs to keep their burnished appearance. Venetian bronze – The metal in the Venetian bronze finish reflects more light than its darker oil-rubbed bronze cousin. The smooth finish can look like a pewter gold color with a matte appearance. The manufacturing process to create the finish makes the Venetian bronze slightly more expensive. Oil-rubbed bronze – This darkish finish has a slightly oily surface and a black matte sheen. Both need a light coating of furniture wax to replace the protective finish that can rub off during installation. They will need to be cleaned with a soft cloth on a regular basis and get a good waxing or touch up with furniture polish at least once a year. This bright beauty works well with thick slabs of granite and off of glass shower tiles in bathroom and kitchens. Gold and brown hues make the Venetian bronze fixtures and hardware pop. It doesn't easily show water spots or fingerprints and lasts for years. It looks dramatic against bright and soft colors such as antique white or ocean blue cabinets and porcelain sinks. Traditional styles such as Mediterranean, Baroque and Tuscan work well with the dramatic oil-rubbed bronze. It is slightly more expensive and does require more upkeep than chrome or nickel finishes. 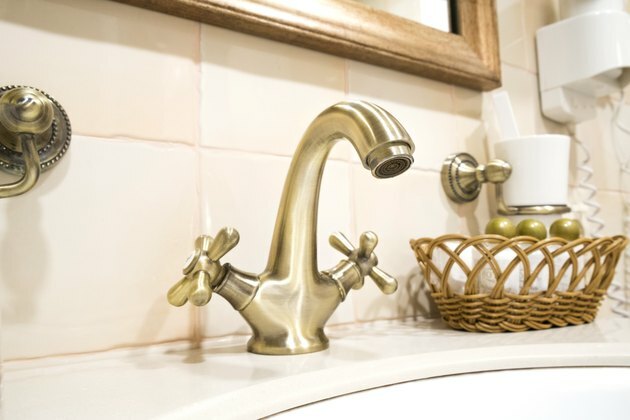 Brass was a popular decorating choice for shower edging, faucets and mirror edging in the '90s. 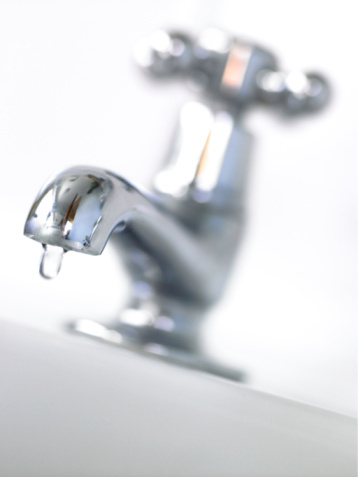 It can make any decorator or new homeowner balk. However, the durable material easily flips to bronze with the correct application of paint and sanding.